Merry Christmas Eve! Cory and I discuss the etiquette of holding a beverage before digging into the evening’s action. It’s anyone’s game heading into Final. If Avishai doubles his score, he’ll have 21,200. To cover him, Brian will need to wager 9,200. An incorrect response will leave Brian with 2,800. To stay above his total, Avishai can wager up to 7,800, and Becca can wager up to 4,800. A successful doubling will put Becca at 15,200. To cover this, Avishai should wager at least 4,600. 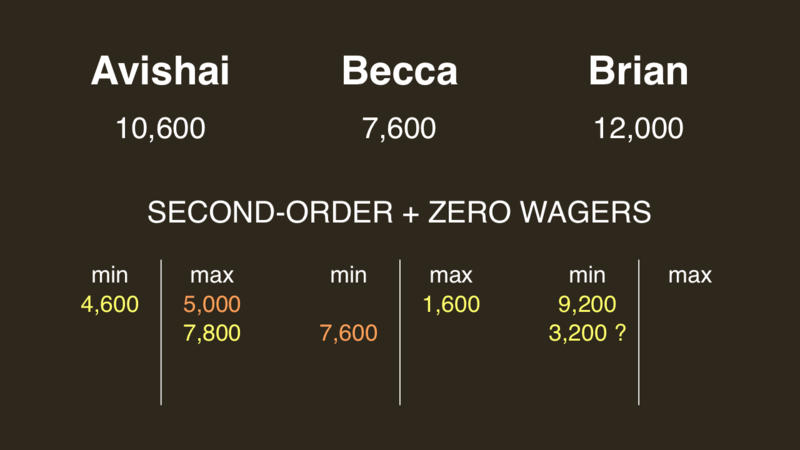 I’m removing Becca’s larger maximum wager because it will be irrelevant. 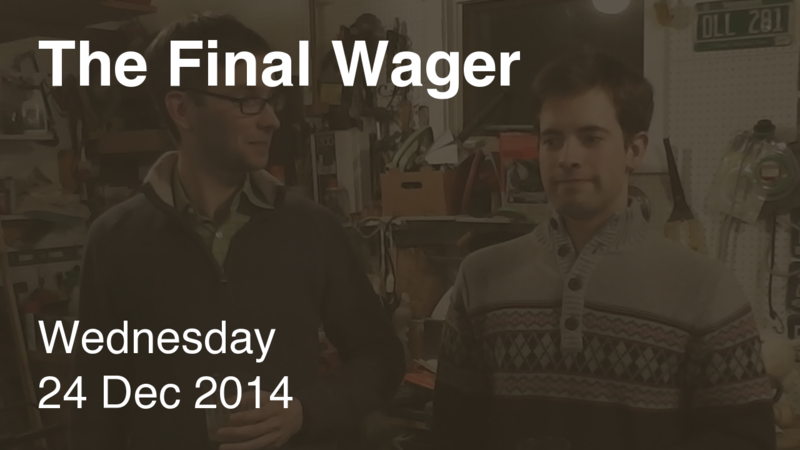 If Avishai makes the rational maximum wager of 7,800, Brian will need to wager 6,400 to cover him. If he’s wrong with that wager, he’ll be left with 5,600. To stay above him, Avishai can wager up to 5,000. Brian should just go for the lockout rather than get cute. 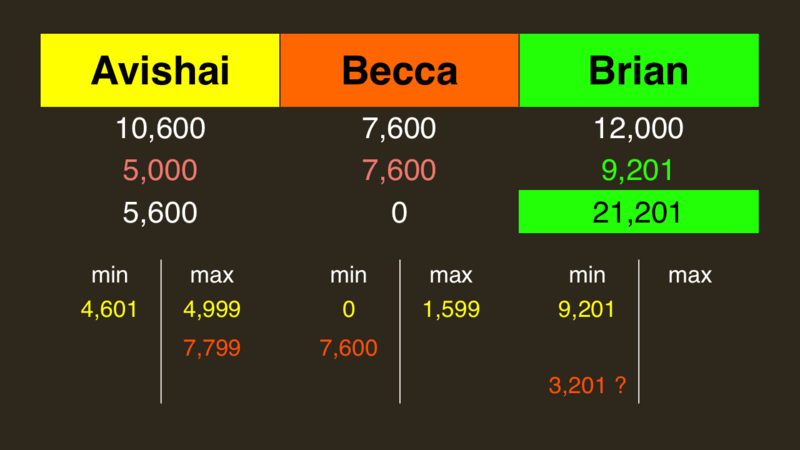 Against Avishai, Becca can wager at most 1,600. With a correct response, she’ll have 9,200. To stay above this, Avishai can wager at most 1,400. That would force Becca to respond correctly, so she might as well wager everything if she anticipates this smaller wager out of Avishai. Nothing really in the way of zero coverage here. If I’m Becca – and Cory poses this question to me in the video – do I pick the small range or the large range? It all depends on what I think Avishai will do. Will he go big? Then I wager small and pull for both him and Brian to miss, because I have no hope otherwise. If he’ll go small, however, then I must go in. Becca picked wrong. It’s not a bad wager. Who are Audrey Hepburn and Katharine Hepburn? See my 12/23 comment for details. In the last 10 games (counting tonight) we have the following result: In 1 case all three got it right = easy. 5 cases of 1 right + 2 cases of 2 right = 7 ok and 2 cases of 0 right = hard. So that’s a “final jeopardy degree of difficulty = just right” score of 70%.